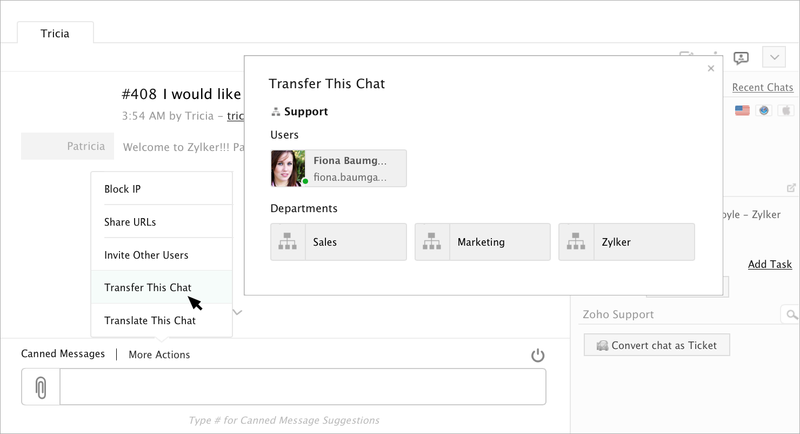 Because you aren’t always the right operator to answer a specific question, or you need to take a break or leave for the day, we give you the power to easily transfer an ongoing live chat to another operator. Inside the chat view window, click "more actions". Select the agent you wish to transfer the chat to from the list. If you can’t find the specific operator you need, use the included search to locate them. Click that operator. Now that you have selected the agent, you can leave that agent insight about your current chat session by leaving a helpful comment in the description area. Click "Transfer" to hand over the chat. Select the Department you wish to transfer the chat to from the list. If you can’t find the specific department you need, use the included search to locate them. Click that operator. Now that you have selected the Department, you can leave that agent in that department an insight about your current chat session by leaving a helpful comment in the description area.